What democracy really means is the capacity to do things. While the governing elite has increasingly borrowed populist rhetoric from the extreme right to win elections, it has also used the growth of populism to discredit the concept of ‘the people’ and redefine the meaning of democracy. A rally for Marine Le Pen in Montpellier, France. Demotix/Xavier Malafosse. As exemplified in the recent debate between Philippe Marlière and Catherine Fieschi, populism is a highly contentious concept, and yet one which cannot be avoided when discussing contemporary politics in Europe. More interesting is that this debate brings to light a prominent mindset in contemporary academia and policy making, in which 'politics' tends to be limited to its consensual liberal 'moderate' form. There is little doubt that, at least before Marlière’s response, Fieschi's argument won over many of the readers of a platform like openDemocracy. However, while reassuring, such an argument can easily lead down a slippery slope towards a patronising view of the 'people' and their very real problems, insecurities and hopes for change, however misguided. Further, understanding populism as anything more than a political rhetorical style is bound to generate some inaccurate conclusions as to the state of our democracies in these times of crisis. Following Fieschi and Marlière, I agree that populism relies on the ‘pitting of the elite against the people’. But if this vague ‘people’ is to represent the basis for a populist ideology, as Fieschi suggests, one could potentially (and inaccurately) argue that a populist party is the party of the people, the true democratic representative, therefore giving it incredible power, particularly in our much reviled post-political world. Almost 10 years ago, Annie Collovald (Collovald, 2004), to whom Marlière initially referred, brilliantly noted that the new populist classification was ‘blurrier, but also less stigmatizing than the ones it is meant to replace, such as fascism or extreme right’. As a logical yet perverse development, the extreme right, now linked to the people, acquired a legitimacy which it had been denied since the end of the Second World War. Extreme right parties became the real democratic parties, while other ‘elitist’ parties were portrayed as against the people and their wishes. While their electoral and popular support actually remained marginal, the link created between the classes populaires and the extreme right through the term ‘populist’ transformed the themes defended by extreme right parties into popular demands. Indeed, it is worth remembering that the Front National stagnated from 1988, and that their 2002 electoral ‘earthquake’ was in fact more the result of high abstention levels and distrust of the two main parties, than the irremediable rise of Le Pen (Mondon, 2013). Yet, as I have discussed elsewhere, the association between the people and the extreme right did indeed lead to the mainstreaming of their policies and programmes. This situation has been aggravated by a deepening socio-economic crisis and loss of faith in the democratic process, in turn allowing the extreme right to become the only option on the political spectrum offering real change and hope. No matter how flawed, such an alternative has been appealing precisely because it was the only one. Thanks to a lack of alternatives due in part to the post-Cold War weakness of the extreme left, the extreme right does not need to provide any concrete solution; it can offer contradictory or incompatible propositions (anti-communism, ultra-liberalism, anti-capitalism, protectionism, etc.) leaving as its only coherent point its claim to be the ‘party of the discontented’. The growing section of the population to which the extreme right appeals suffers from what Chantal Mouffe has called a feeling of uselessness in the ‘post-political’ democratic machinery. The success of right-wing populism is thus the direct consequence of the death of alternative ideologies, or Cornelius Castoriadis’ ‘second disenchantment of the world’, in which ‘liberal progress appeared to part of the population as emptied of any meaning while the communist was represented as a form of hell’ (Castoriadis and Droit, 2002). However, instead of acknowledging the need for a radical alternative to the current hegemonic system, the elite have too often blamed the people for their irrational reaction, trying to bring all kinds of radicals back into the mainstream, and therby reinforcing their grip on society. Beyond its potential as a legitimiser of the extreme right, populism has also been used by the social elite in order to show the ungovernability of democracies, due to the so-called authoritarianism of the classes populaires. The rise of the extreme right became the perfect excuse for those in power, whether from the left or the right, to explain the inability to gather vast support during elections: if abstention and alternative parties are rising, it is because the people do not know what is good for them. For Mouffe (Mouffe, 2005), it is ‘the lack of an effective democratic debate about possible alternatives that has led in many countries to the success of political parties claiming to be the ‘voice of the people’. What Mouffe criticises is the apparent unanimity in the state of politics, elsewhere described as the politics of consensus (Rancière, 2005): western democracies have reached a final stage in their development, the ‘end of history’ argument. Popular sovereignty – the democratic symbol par excellence – has now been superseded by the values of the market. Worse, it is now ‘usually seen as an obsolete idea, often perceived as an obstacle to the implementation of human rights’. In our democracies, human rights are commonly used and perverted in order to claim that the ‘democratic’ system works for the general good, beyond partisan factions: with human rights as the product of liberalism, the system is above all suspicion. It is such factors that can be argued to have been the cause of the appearance of right-wing populism, because of the absence of antagonism in politics nowadays and the rejection of this so-called final stage of politics by a vast portion of the population. While the use of populism to describe the extreme right has lessened the stigma which marginalised it for decades, the creation of a link – albeit a semantic one – between such parties and the ‘people’ has forced blame for the situation onto the latter. What appears menacing in the extreme right is not its ideas per se, but its role as ‘the voice of the people’. While it has increasingly borrowed populist rhetoric from the extreme right to win elections, the governing elite has also used the growth of populism to discredit the concept of ‘the people’ and redefine the meaning of democracy. As such, one of the most important consequences of the rise of right-wing populism in western democracies has been the shift in the coordinates of the traditional left/right opposition. What used to be considered part of the class struggle has become a fight between pro-human rights democrats and ‘losers’ ready to vote for ‘monstrous’ figures. To mainstream politicians, ‘the people’, whatever their definition, are no longer the basis of democracy, but purposefully turned into an issue, an obstacle for the human rights agenda: their search for alternatives and refusal to settle for mainstream parties are discarded as short-sighted, naïve and even dangerous. More precisely here, the link between the irrational and shameful vote for the extreme right and the people in general, through the term ‘populism’, has allowed the governing elite to feel more secure in their endeavour: ‘if the people have become more authoritarian and reactionary, it is because of their own ignorance and naivety’, not because those who are meant to represent, or defend, the people have abandoned them (Collovald, 2004). In turn, this has justified the premise that the sole purpose of elections is the transfer of approval to those who are judged – or often judge themselves – qualified to lead the people, leaving the demos with no choice or power (cratos). Therefore, some have argued, a populist reaction is inescapable as the people are bound to rebel against the more pragmatic necessities of the regime (Canovan, 1999). Populist outbursts are unavoidable in a democracy, since our elitist, ‘rational’ and ‘technocratic’ governments cannot impose their legitimacy on the ignorance of the people, and as a result, populism cannot but happen. The term ‘populism’ becomes the weapon against all the ‘forms of secession from the dominating consensus’ whether they are democratic, racially or religiously fanatical (Rancière, 2005). For Rancière, populism ‘hides and reveals at the same time the great wish of oligarchy: to govern without people, which is to say without a divided people; to govern without politics’. Pushing this argument further, the rise of the extreme right could be considered a consequence of the abandonment of older, more inclusionary, political agendas. While the vote for the extreme right undeniably has some racist and exclusionary quality, its roots can be found in part in more constructive demands made by the electorate. By entirely replacing its protest quality in favour of ideological adhesion, many on the Left have overlooked the underlying class struggle at hand. Crucial to this neglect is the fact that those who are accused of voting for the extreme right make up part of the population facing the main economic challenges related to immigration and globalization. With the discredit thrown on the extreme left after the fall of the USSR, and the mainstream left’s resulting turn towards the middle class, a void was created. While many in the broad working class remained loyal to social democratic and labour parties, a growing number turned to abstention and the most alienated to the extreme right. The lack of alternative solutions to growing social insecurities has left the field wide open for the extreme right to sow and reap among disillusioned parts of this electorate. As a result, the understanding of the issue has shifted from class struggle to race and ‘civilisational’ struggle. For Alain Bihr (Bihr, 1998), the shift to the extreme right occurred when the individual was no longer able to turn resentment against their present situation into ‘a force of critique and creation, into an effective revolt’. Therefore, the resurgence of the extreme right under the guise of populism is a much deeper political issue than the simple and clear expression of extreme right passions and ideas. Understood in this manner, the vote for parties such as the Front National is no longer restricted to a demand for the ‘established parties’ to follow what the extreme right offers, but a call to tackle the real problems that part of the population is experiencing. Understood as such, it is social insecurities and their source, rather than immigration, that become the central issue. This is not to say that wanton racism is not present in the extreme right electorate; it is simply to acknowledge that the voters who have used these parties as a form of protest would certainly have demands other than the racism or neo-racism promoted as a solution by their ideological supporters. This was confirmed by Nonna Mayer’s study of the ‘niniste’ electorate (neither left, nor right). The ‘ninistes’, who made up approximately half of the Front National electorate in 2002, were pessimistic and confused voters who found no place for themselves on the political spectrum, who were devoid of strong ideological convictions, gladly abstentionist, and, in many ways, similar to a left-wing electorate (Mayer, 2002). Indeed, these voters were at times more progressive on moral values than the average electorate; for example, they were more amenable to abortion and homosexuality and less severe on minor infractions. On economic grounds, they supported strike movements, the creation of public jobs, the 35-hour week and the increase of the minimum wage in much higher numbers than other Front National voters, and in slightly higher numbers than non-Front National supporters. However, they were more reactionary on questions of immigration and in their distrust of the state. They were also much less interested in politics, not affiliated to any party, not hostile to the left, yet distrustful of and disappointed with both the left and the right. 94 per cent believed that ‘democracy functioned not very well or not well at all’ (Mayer, 2002). While it has evolved since Mayer’s survey and been made more acceptable, the extreme right vote cannot be considered solely an exclusionary demand for tougher immigration programmes. On the contrary, it can be interpreted as a demand for an inclusionary alternative, albeit a clumsy, counterproductive and condemnable one, to protect some of ‘the people’ from social insecurities. While the rise of populism must be taken seriously, it is crucial not to misinterpret the populist push, something which has too often been the case. The rise of the populist extreme right in the past two decades should not be viewed as positive, ‘constructive’ or as a ‘corrective’, since it served as an indicator of the worrying state of western democracies at the beginning of the third millennium. Before these parties were accepted into the mainstream, most voters’ motivation to choose the extreme right was not based on a real adhesion to their ideas (Mayer, 2002), but on a will to defy governing institutions and an elite regarded as careless and undemocratic. Therefore, one cannot assume the equation of voter with party, at the risk of legitimising such parties further and thus reinforcing their appeal. Instead of blaming the people for their ideological defects leading to irrational voting, acknowledging the importance of the protest vote within those of the extreme right sheds light on the problems within actual democracies, such as the lack of an alternative and the desire of many to follow a different path. Defining populism as a rhetorical style is therefore essential if we want to hear the various demands made by the ‘people’ in its broadest possible sense. Using it as such also allows analysts or politicians not to fall into the populist trap which would have us believe that so-called populist parties truly represent a democratic wish. Rather than fuelling this exclusivist and authoritarian push, what we must strive for is the reclamation of the emancipatory meaning of democracy, and beyond that, of politics. As Josiah Ober (Ober, 2008) has noted, accepting that democracy only relates to a voting protocol for determining the will of the majority, equates to accepting 'fifth-century anti-democratic polemics as an accurate description of political reality’. Democracy, as opposed to monarchy or oligarchy, is not concerned with numbers: democracy is not the will of the majority, but refers to ‘power’ in the sense of ‘capacity to do things’. Therefore, reducing democracy to elections elides much of its value and potential. Voting is not democratic in itself if it only promotes the exclusionary and unfair status quo that all major parties currently defend (including right-wing populist ones), or if it takes place in an environment where misinformation prevails. What makes a movement democratic is not universal suffrage on its own, but the will of its protagonists to empower themselves to take part. Therefore, it is the realisation that only through a radical reassessment of what is believed to be democracy today that a democratic change can happen: democracy must be for all or not at all. BIHR, A. 1998. Le spectre de l'extrême droite; les Français dans le miroir du Front national, Paris, les Editions de l'Atelier - les Editions Ouvrières. CANOVAN, M. 1999. Trust the People! Populism and the Two Faces of Democracy. Political Studies, XLVII, 2-16. CASTORIADIS, C. & DROIT, R.-P. 2002. Entretien. In: DROIT, R.-P. (ed.) La compagnie des contemporains: rencontres avec des penseurs d'aujourd'hui. Paris: Odile Jacob. COLLOVALD, A. 2004. 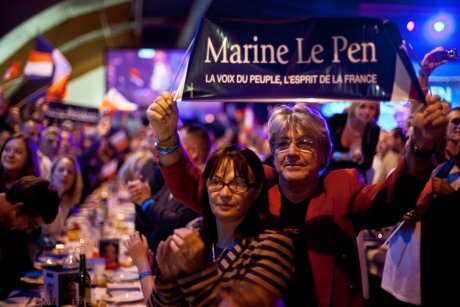 Le populisme du FN : un dangereux contresens, Bellecombe-en-Bauges, Ed. du Croquant. MAYER, N. 2002. Ces Français qui votent Le Pen, Paris, Flammarion. MONDON, A. 2013. Nicolas Sakozy's Legitimisation of the Front National: Background and Perspectives. Patterns of Prejudice. MOUFFE, C. 2005. The ‘End of Politics’ and the Challenge of Right-Wing Populism. In: PANIZZA, F. (ed.) Populism and the Mirror of Democracy. London ; New York: Verso. OBER, J. 2008. The Original Meaning of 'Democracy': Capacity to Do Things, not Majority Rule. Constellations, 15, 3-9. RANCIÈRE, J. 2005. La haine de la démocratie, Paris, La fabrique éditions.